I’m thrilled with early reactions to my new book, 11 Deadly Presentation Sins (in case you hadn’t heard). It’s always fascinating to hear other perspectives on something you’re so close to and immersed in. So I’ve put together the top seven questions that have been raised about the book in reviews and blurbs, on Amazon and in direct conversation. 1. Can You Turn a Bad Speaker Into a Good One? If the reason the speaker’s “bad” is because he just can’t put words together when talking aloud (and I’ve met some otherwise successful executives who have this issue), then it’s going to be tougher. But generally I believe you can make every speaker better with just a few adjustments. You might not be able to make him great, but you can make him better. 2. Who’s the Audience for This Book? Anybody whose job or life involves talking at some point to one or more people. Yeah, that’s everybody. But if I had to narrow it down, I’d say 11 Deadly Presentation Sins is targeted to beginning and intermediate presenters. However, I have had professional, paid speakers tell me that even they came away with some nuggets of wisdom from the book. And in the middle is a vast group of people who do tons of presentations at work. They’re not paid speakers, so they’re not facing a “market” that constantly demands they improve. They are just very ordinary, probably very dull speakers. They may not know they have a problem, but their colleagues would be delighted to see them do a better job. 3. “Deadly Sins?” Hyperbole Much? I often make obscure references to ’70s-era advertising slogans and back-catalog REM lyrics, but I thought this one was pretty obvious. I don’t think you have to be a Catholic or a Christian to have heard of the 7 Deadly Sins. But a couple of people’s comments make me think otherwise. To be clear, the book title is a takeoff on that. Now are the presentation problems I talk about truly sins and truly fatal? No. I suppose a more accurate title might be, 11 Common Presentation Mistakes That Could Hinder Your Effectiveness as a Speaker. But that doesn’t seem very marketable. And anyone who’s sat through her share of really bad PowerPoint presentations can likely attest to the figurative, if not literal, slow death that occurs. The death of your spirit, the death of your expectations for a good day, the feeling of despair that comes from another wasted hour of precious life. And say you have a really big speech to do—closing a big sale, or appearing at a huge public event—if you blow it, that could well be a career killer. So yeah, I’m good with the title. Very good question! Seven would be the obvious number, right? To match the actual 7 Deadly Sins? But I couldn’t narrow it to seven. What four sins would I cut? Ugly Visuals? Low Energy? A Flat Opening? No Audience Interaction? I could see cutting one or two perhaps, but not four. And, of course, in the conclusion to the book I talk about another seven potentially deadly sins that didn’t make the cut. Sins like Monotone Delivery, Lack of Humor, No Soundbites. But most of these are advanced skills and not true dealbreakers. In the end, it came down to marketing: 11 rhymes with 7. 5. Do We Really Need Another Book on Presentation Skills? Another word for “market,” of course, is “need.” And I think there is a genuine need out there for help with public speaking and presentations. It is SO important to be able to present your ideas in clear and compelling terms—whether you’re interviewing for a job, attending a networking event, selling a product, or trying to get your way with your condo board. There are lots of sources of expertise out there, and I cite many of my favorites, including Nancy Duarte, Mitch Joel and Carmine Gallo. But you never know what’s going to resonate with people. The stories and examples I use and the way I frame my arguments may appeal to some people while another approach may leave them cold. Or vice versa. That’s the beauty of the marketplace of ideas. 6. Isn’t This Book Kind of Short? One reviewer said he read it an hour! He’s definitely a faster reader than I am, but I admit when I got to the end of the writing phase and saw that it was 20,000 words (my last book was 40,000), I wondered if I should find a way to make it longer. I could have added more sins, but I felt the ones I had listed were the right (and most important) ones. And I thought about expanding each chapter, or filling out the book in some other way. Besides, it’s not as though it’s fluff. I pack more than 100 practical tips (yes, I counted) in those 124 pages. 7. Am I Really as Handsome as the Back Cover Photo Indicates? Don’t be ridiculous! Behold the magic of professional lighting and photography! And for the record, I have better glasses now, which have the advantage of covering more of my face! Any other questions? If not, click here. 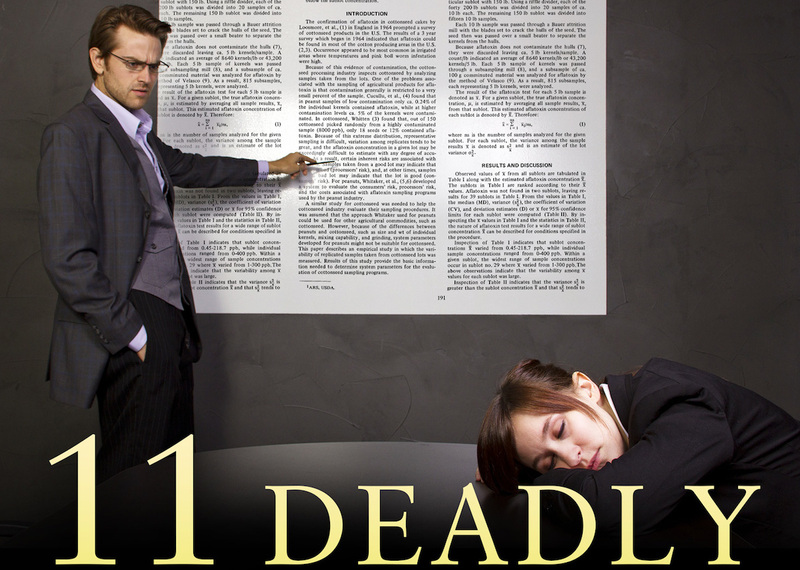 11 Deadly Presentation Sins: On Sale NOW!